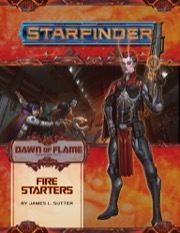 "Fire Starters," a Starfinder adventure for 1st-level characters, by James L. Sutter. I am at a strange place with this AP. The summary for the whole thing puts me off, as it has a too high fantasy feel (and also sounds almost the same as Legacy of Fire, efreeti invasion and all) but the individual books descriptions all sound good. I feel the same Marco. Between this and the Doomsday Dawn scenario it very much feels to me like someone at Paizo is waxing nostalgic for Legacy of Fire! I feel the same way, I suspect. One of the things which makes Starfinder so popular with myself and my players is that the Starfinder setting presents itself as a technologically-flavored setting, where magic exists as a kind of "parallel power structure" existing alongside tech. 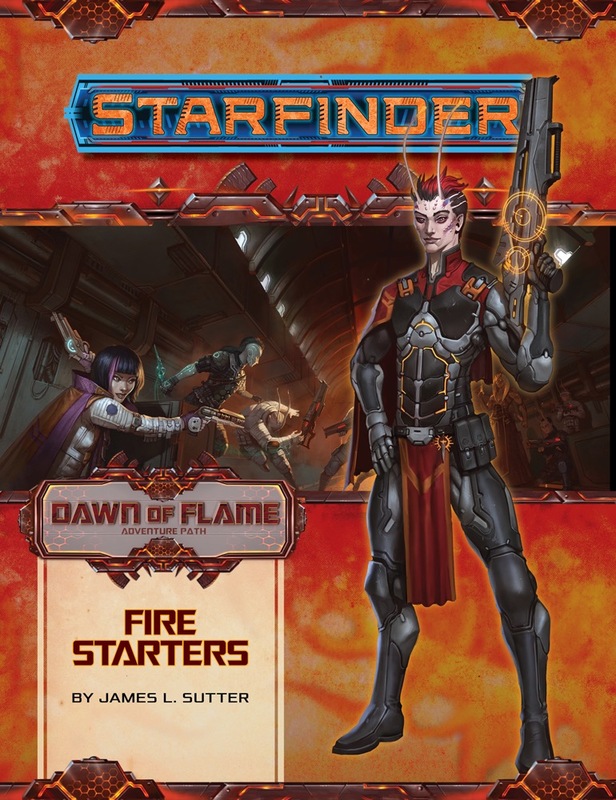 For us, this makes Starfinder science-fantasy more akin to Star Wars (with magic swapping in for the Force) than most of the tabletop science-fantasy rpgs which have come before -- which typically felt like "D&D in Space" (Spelljammer, Dragonstar, et al). As you suggest, this Adventure Path reads like somebody's fantasy Pathfinder adventure (an efreeti invasion of the prime plane)transplanted into the Starfinder setting. The technological flavor of Starfinder's setting seems backgrounded to mere window-dressing here to allow the high-fantasy shenanigans to take center stage. This is the first Starfinder adventure product I'm likely to pass on buying or running. I think I'll wait to see what the reviews have to say this time. From GenCon panels and the like, it does sound like there are tech-focused solutions to the problems inherent in exploring the heart of a star. For my part, I'm super into this mix of magic, machinery, and Plane of Fire stuff! I like that the Pact Worlds' sun is populated and that there are social ramifications for an extraplanar invasion here, something that'd require a lot more verisimilitude hoop-jumping to pull off in straight fantasy. I could do without the Plane of Fire stuff, but they are exploring a star, which means Fire-themed monsters will likely be prevalent, the description only mentions one Efreeti, and an army of undisclosed race/species. Space-themed series have quite a history of dimensional invasion/incursion. The fact is, there are things in the sun, some of them native, some of them extraplanar, some of them extrasolar, and some of them just as confused as a whale who finds itself falling from the sky would feel. I myself love that we finally get planar stuff on Starfinder PLUS having finally a weird location for Starfinder AP. I mean, all previous APs were rather standard scenarios, while adventuring in city inside sun is something unique. That said, I just find weird that this is apparently level 12 AP since BBEG is apparently borderline divine being ._. I'm actually really excited for this Adventure Path because on premise, it feels like the first adventure to really deliver on the concept of a science fantasy adventure. More planar stuff and crazy magical kerfluffles, please! Any idea what level this Adventure Path runs to? Stopping a demi-god should be a pretty high-level task. I really hope that the next AP starts and ends at a higher level. Such an Adventure Path could allow the pcs from "Dead Suns", "Signal of Screams" and "Dawn of Flame" to be played further. Monday should hopefully get us a cover update. For what it's worth, the amount of high fantasy content in this is what I find appealing about it; there are any number of good systems and settings out there for doing harder SF, and lots of fantasy in the science-fantasy mix is what I am starting to rally appreciate in Starfinder. When is this (and the other february 2019 products) getting updated? Hey Marco, we don't have any specific dates that we consider deadlines for product updates or creating product pages. Many of the updates get fit into workflow schedules as time permits. I think there are a couple updates pending for February products that will be entered sometime in December or January. I don't have an estimated time for when July products will get pages, my guess would be sometime within the first quarter of 2019. Product announcement and page creation are based on information from several departments and to my knowledge we've never set a public date or timeline on when those will occur or when we would consider them late. On side note on people complaining that this sounded like too much fantasy, considering that first Starfinder AP is one that would fit in completely scifi setting(even if its soft one with psionics) without any magic or fantasy in its premise, I think its fair to have more Scifi Fantasy campaign with emphasis of "Hey there is more fantasy elements in this besides mages and magic!" I would like to start saying that the cover looks amazing! Those colors look great and remind me of Legacy of Fire. If you don't want it so sound like fantasy, you can say the elemental plane is another dimension and that the outsiders are interlopers/aliens from said reality. I for myself am excited to see how the elemental planes will change in response to the advancement of technology. There are rare occasions, like the first Ruins of Azlant volume, where the cover is of a friendly NPC. It's also possible that the Asana town psychics go crazy as a result of this AP beginning. "Dead Suns" did a good job of fleshing out Castrovel in AP #2 & Eox in AP #3. AP#11 showed us the capital city of one of the largest "ring nations" along the terminator belt of Verces. "Dawn of Flame" looks to examine the sun very thoroughly. Personally, i'd love the fifth AP to be a shorter one for the levels 13 to 20. Is there a Twi'lek-esque creature in the background image, just underneath the main NPC's gun? Or is it just me? I am pretty sure that is a Lashunta. It certainly resembles one, but I think it's most likely just poorly drawn hair that is swept down in points over the shoulders. I take that back -- I was looking at the wrong half of the cover -- the side with the iconics. Now my guess is that this is some sort of new species that will be detailed as either a monster or a playable race in this volume. We should know for sure in a few weeks. Hopefully we'll see the geniekin as playable races in these books, makes sense with the general elemental theme. If the gazetteer is about a planet with ties to the plane of water maybe book one will have Undines? that leaves togruta and zeltrın from star wars side remaining let's hope we get series of saving the princess adventure pats near future. Actually, this is what draws me to this AP, like a moth to a flame. (Pun totally intended!) I've been wanting to use the Alluria Publishing Cerulean Seas setting since I bought it last winter. The idea of bubble cities works well for me, and there are teleportation pools in the psionics book, so I think this could work. Not a journey to the sun, but the steaming hot core in the deepest parts of the ocean, where aboleths and other evil creatures swim. -Elementals: Ice, Lightning, Magma - but not Mud (Bestiary 2)! Darkvision, Fire Resist 5, Overheat Spell-like ability & Fire Affinity: roll twice 1/day for fire attack. The individual volumes will probably and hopefully differ enough from each other, but compared to Dead Suns it sounds rather dull. If the Alien Archive sections are as good as the one in this book, it will be worth it for them alone, though. but compared to Dead Suns it sounds rather dull. How does Starfinder Efreeti wish granting work? Still 3/day? Still full wish, like the Technomancer spell? All thermonuclear plasma clouds kind of look the same. While Dead Suns visits another planet which is totally different from the one before in every volume, every Dawn of Flame volume takes place in the sun. It is certainly possible to make the individual volumes feel different from each other (book 4 sounds pretty different from the other ones), but it is also possible that they will feel very similiar. Most of Pathfinder APs all take place on two continents of one small planet, yet you don't complain. If I remember correctly, book 1 is in a Lashunta town, book 2 is in a city with a faulty shield, so the population is mainly creatures with fire/radiation immunity. And Book 3 is in a dome that is a giant jungle and full of criminal ran casinos. Does Asanatown have its own city block? If yes, then what are the population, demographics and alignment? The sun is electrical in nature. The Paizo forums have been an excellent source of fringe scientific theories lately. Yes, it is still 3/day. Still a full wish like the mystic and technomancer ability of the same name. It gets 7 pages plus one page of psychic options. Firat Solhan did an amazing job with the page border art on this series. All the art in this book simply looks wonderful! I love this idea! Then after that, they can make high-level modules/ super dungeons where you start them as 19 and then level up in them gaining your capstone abilities. Agreed. I haven't gotten to reading the words yet, but the art and design are really nice in this book. Any word on if there will be Society rules/chronicles for this AP?